An article published in « Materials Research« , april 2014. 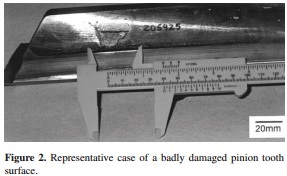 An investigation was made to determine the causes of surface contact fatigue failure of a case hardened driver pinion located in the intermediate shaft of a reducer gearbox used in a sugar and alcohol mill. The examination of the component revealed the presence of a cemented layer substantially thicker than that generally specified for pinions devised for this application.